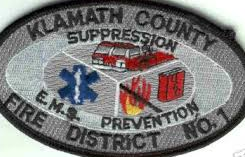 Klamath County Fire District No. 1 (Fire District No. 1) EMT’s are responsible to carry out all duties assigned by their supervising Company Officer. EMT’s are required to work in strict compliance with all rules and regulations that govern Fire District No.1. Respond to a variety of emergent and non-emergent incidents. Perform duties under the supervision of their Company Officer, working with other personnel as a company unit unless otherwise ordered. Provide emergent and non-emergent pre-hospital care and/or transportation and shall perform and/or assist in medical inter-facility transports. Work in close quarters during a 24-hr. shift and must have the ability to maintain a harmonious relationship with all other employees and the general public, even under stress. Understand and follow oral and/or written instructions during stressful and non-stressful conditions. Communicate effectively utilizing oral, written and electronic means completing required records, reports, and forms in a timely manner. Understand the Incident Command System (ICS), and the Accountability System as adopted by Fire District No.1. Perform a variety of routine station duties as directed by their Company Officer which may include daily apparatus checks, housekeeping duties, and routine station maintenance, minor vehicle repair and maintenance; routine monthly and quarterly apparatus and equipment checks. Participate in daily training activities as prescribed by the Training Division or Company Officer including instructing all emergency service topics as it relates to their level of PPE. Maintain proficiency in EMS skills applicable to their EMT scope of practice. Proficiency is based on performance standards with a strong emphasis on safety. Maintain proficiency in the operation of assigned apparatus including all aspects of driving, and associated apparatus operations. Be knowledgeable of street names, layout, physical conditions, locations, block numbers, and target hazards within Fire District No. 1. Have an in-depth knowledge of their assigned response areas. Participate in various internal committees and groups working toward increasing the efficiency and effectiveness of departmental operations. Provide input in the Budget process and be knowledgeable of departmental purchasing procedures and limits. May make routine station purchases at the direction of the Company Officer. Perform many difficult tasks in extremely hazardous environments, such as driving off apparatus, lift heavy loads, climb ladders, work at heights and in confined spaces. May be required to perform these and other duties in cold and hot weather environments for extended periods of time without relief. Perform duties at assigned station in accordance with the departmental work rules, policies and procedures, standard operating guidelines, and the Labor Contact. Maintain a current driver's license valid in the State of Oregon. Maintain EMT certification, current at the time of hire, for the duration of employment. Oregon Paramedic or EMT (all levels). National Registry Paramedic and EMT’s will be accepted during the application process, but candidates must obtain and provide proof of Oregon certification by date of hire. Out of state applicants can go to http://egov.oregon.gov/DHS/ph/ems/certific/recip.shtml for further reciprocity information. Retirement - Fire District No. 1 participates and contributes to the Oregon Public Employees Retirement System (PERS). This is a PERS General Service Position. Medical - Fire District No. 1 pays ninety-five percent (95%) of all premiums for each employee and their families and personnel pay five percent (5%) of all premiums. Fire District No. 1 participates in an IRS Section 125 Flexible Spending Account. In addition, Fire District No. 1 annually contributes to an individual HRA/VEBA for all eligible personnel. Vacation - Vacation is accumulated at seven (7) shifts per year and increases with time in service. Sick Leave - Sick Leave is accrued at sixteen (8) hours per full calendar month of employment. In addition, personnel will be paid fifty percent (50%) of their accrued sick leave upon retirement. Life Insurance - Fire District No. 1 provides $10,000 of occupational AD&D insurance. Additional benefits - Other benefits include optional participation in deferred compensation plans, Fire District No. 1 paid membership in an Employee Assistance Program (EAP), and an educational reimbursement program. Note: Although benefits have been reported as accurately as possible, there has been no warranty of complete benefit summary intended. All information provided and benefits are subject to the actual legal documents and terms of the collective bargaining agreement that control benefit programs. Note: Failure to pass any component of the testing process will eliminate candidates from this recruitment process.